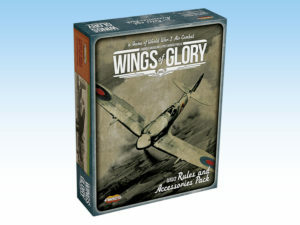 The WW2 Wings of Glory Rules and Accessories Pack is the new core set of the WW2 Wings of Glory line. It has been developed to be both a starting point for new players and a valuable resource for veteran players, providing them with a complete compendium of all the game rules and accessories. 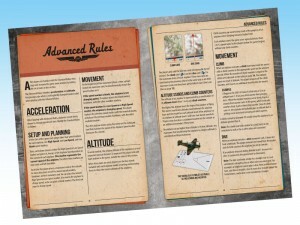 To play, the Rules & Accessories Pack must be combined with two or more Airplane Packs or Special Packs. 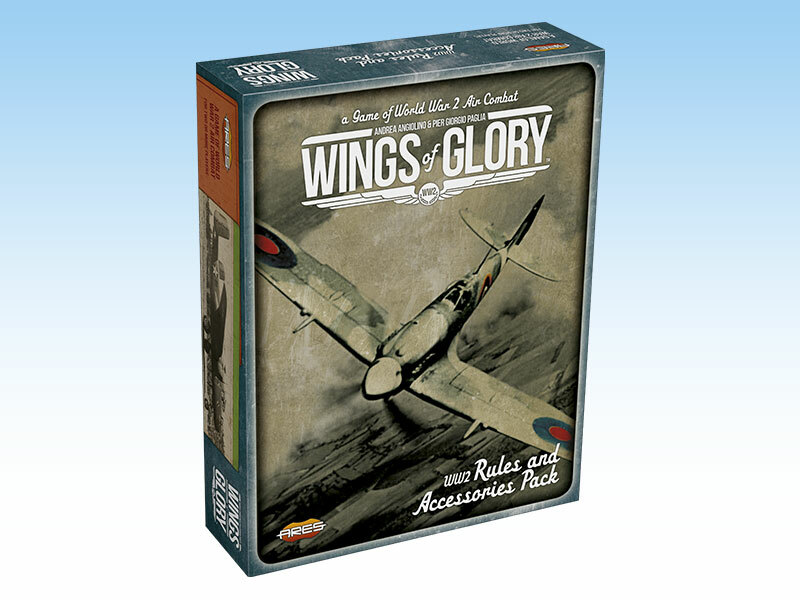 WW2 Wings of Glory Rules and Accessories Pack: all rules and components in one set. To facilitate learning, the 44-pages rulebook is organized in three different levels, starting with the Basic Rules and stepping up to Standard and Advanced rules. The structure allows the inclusion of Optional Rules already when playing at the basic level - each optional rule indicates the level of the rules it can be used with. Optional rules make the game more detailed without making it significantly more complex, and include popular options such as tailing, aiming, and many more. 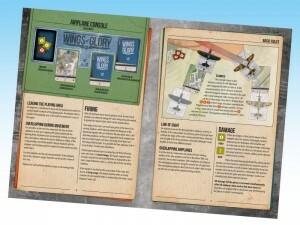 In addition to the rulebook, the Rules & Accessory Pack includes a comprehensive range of components, necessary to play the game: airplane consoles, all the different sets of damage counters, different special cards (such as targets and ground units), rulers, and a lot of counters, markers and tokens, used to manage and keep track of the various game systems - such as special damages and ace abilities. 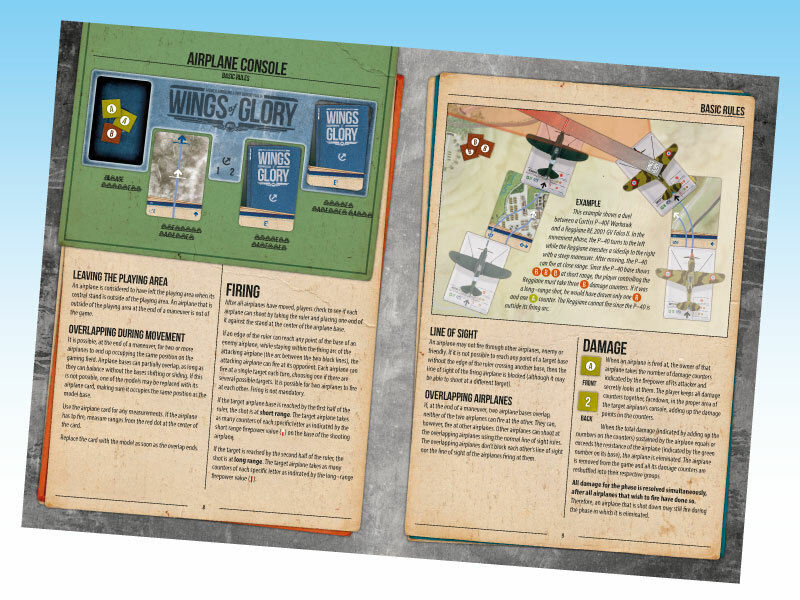 In the WW2 Rules and Accessories Pack all the Wings of Glory game system rules (which in its predecessor, Wings of War, were spread across multiple game sets and expansions) are collected in a full color, perfect-bound volume. Compared to the rulebook included in the WW2 Starter Set (published last year and available for download here) the WW2 Rules and Accessories Pack features a complete revision of the rules. It incorporates the full errata and FAQ, and 12 more pages featuring extra contents: new Optional Rules, Special Airplanes and Weapons. It’s also fully illustrated and includes diagrams, reference tables, detailed base and card anatomy of the special airplanes (such as heavy fighters and bombers), and a comprehensive table of Climb Rates and Maximum Altitudes, including the stats of all the airplane miniatures released until now, and of many which are going to be released in the future. The rules are divided in three difficult levels – Basic, Standard and Advanced. Advanced Rules take the game to a greater level of realism. To take into account momentum and acceleration, now the airplanes cannot freely choose to change speed each turn. Advanced Rules also add the "third dimension" to the game. In aerial combat, the relative altitude of the airplanes is a very important tactical element. When altitude rules are in use, players employ the four stands included with each airplane model, inserting and removing them to show the current altitude of the airplanes. To handle altitude changes, the players also add the last two cards to the maneuver decks of each airplane: the climb card and the dive card. All the Optional Rules contained in the WW2 Starter Set are included in this rulebook, as well as new ones. A very interesting new rule, especially when playing with multi-engine aircraft, is the new Extended Crew Damage rule, which introduces the possibility of multiple crew hits at the same time. Probably the most important addition to the rules of the WW2 Starter Set is the chapter about Special Airplanes. These rules are indexed according to the complexity level – Basic, Standard and Advanced, and Optional - so that special airplanes, such as bombers and heavy fighters, are playable whatever the complexity of the rule set you decide to use. The Advanced Rules take the game to a greater level of realism. The rules allow players to include in the game several type of special airplanes: Two Seaters, Dive Bombers and Multi-Engine Airplanes (such as bombers and heavy fighters...). All the general rules necessary to play are included. However, to avoid that the rules become obsolete when new Special Packs are released, those rules which are are specific to a single airplane are not listed here, and are (and will be) supplied in the appropriate Special Pack. For example, the specific rules applying only to a B-25, but not to other airplanes, are included in the B-25 Special Packs - while all the general rules regarding bombers are included in the Rules & Accessory pack. The next chapter introduces Ground Troops, Anti-Aircraft Guns, as well as Special Weapons which can be used to equip airplanes, such as air-to-ground rockets and the "Schräge Musik", a special weapons used by some German and Japanese fighters. Finally, the rulebook includes a chapter of Scenario Rules, which includes all the rules for bombing (both "Level Bombing" and "Dive Bombing"). Other rules suitable for use in specific scenarios are included in this section, such as Full Load, Drop Tanks, Photo Recon. 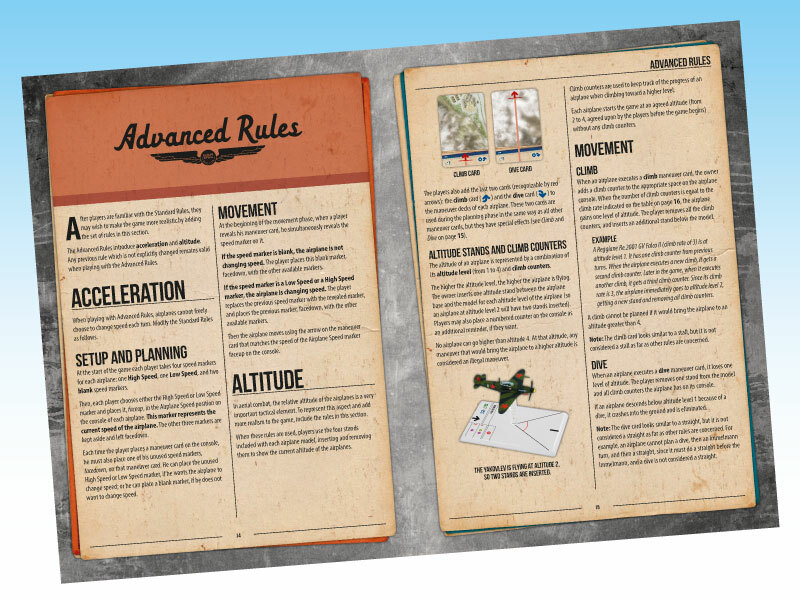 Last but not least, rules for Solitaire Scenarios are included, which allow you to put on "auto-pilot" the airplanes you're trying to take down! - 264 markers, tokens and counters, to handle special damage, ace abilities, manage altitude, keep track of your airplane status (damage to the crew, last maneuver taken, altitude), and more. 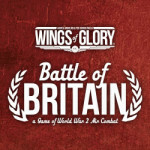 The WW2 Wings of Glory Rules and Accessories Pack doesn’t include any miniatures. It must be combined with two or more WW2 Airplane Packs or WW2 Special Packs. Each pack includes an airplane, its special base, and and its maneuver deck. This pack is also fully compatible with the WW2 Starter Set, and also with the airplane packs and game sets branded "Wings of War".